Gaming Memories - Darcel "I Won't Let This Beat Me" DeNorcy-Fahy (9/8/1984-10/20/2017) — GamingWithSwag.com - Dads By Day, Gamers By Night. 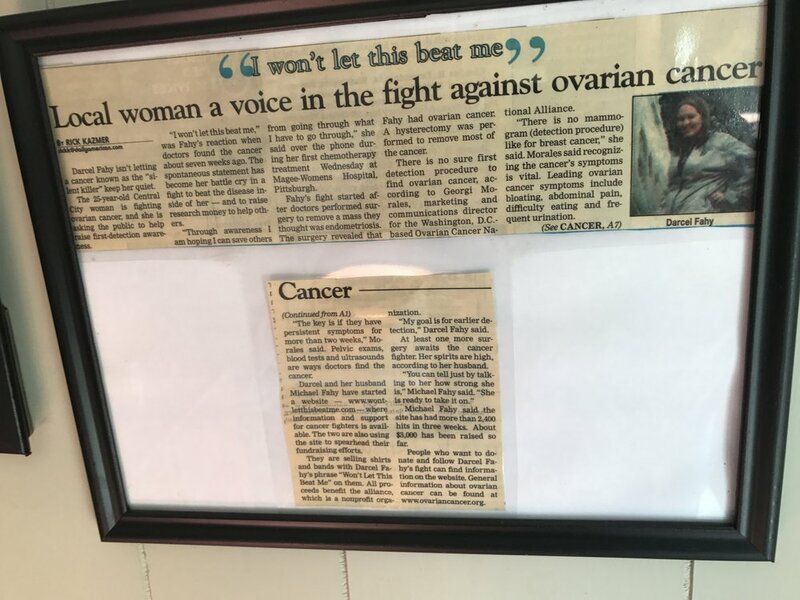 An article showing Darcel's motto and advocacy for awareness and defeat of ovarian cancer. Not too much serious stuff gets posted here on Gaming With Swag, so bare with me as I try to write this post. Friday my newsfeed on Facebook was blasted with news that my second cousin Darcel DeNorcy-Fahy came back from the hospital and was put on hospice before she passed away. She had been battling ovarian cancer since her diagnosis in June of 2010. 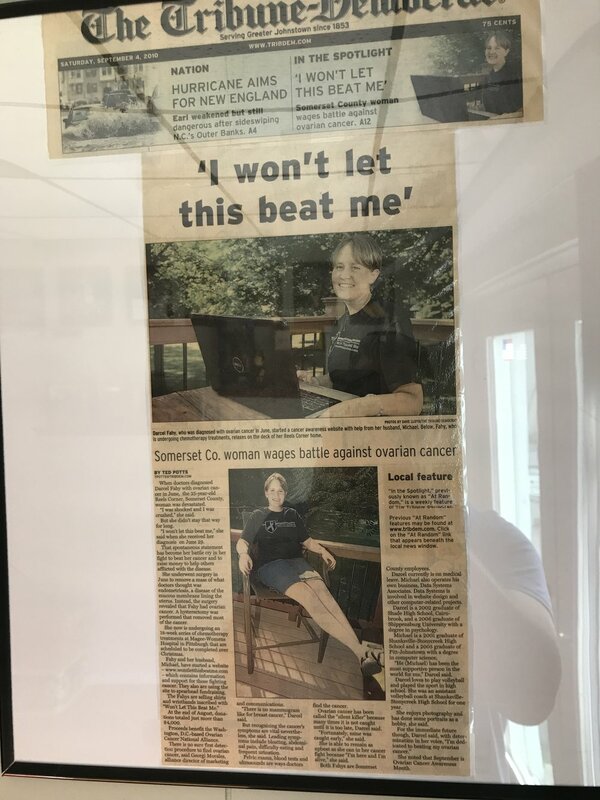 Chemotherapy, blood transfusions, hysterectomy, and multiple surgeries are just some of the bouts Darcel sparred with in the past seven years. Her famous quote of "I Won't Let This Beat Me" inspired us all. Darcel lived on top of a mountain in western Pennsylvania in a former coal mining town over 200 miles away from my hometown in Delaware. This is where she grew up and lived most of her life, with the exception of her college years at Shippensburg University. Still, we made time to catch up with each other whenever possible which usually included my cousin Tom. Articles like these decorate the walls of the residence of Darcel's parents. So what does this have to do with gaming? Well, it always seemed that video games were something that Darcel and I had in common. I remember vividly taking turns playing Tom's Sega Game Gear or passing the Game Boy around in the tent as kids with that giant light that took four AA batteries (on top of the four used by the system itself.) We played Nintendo and Super Nintendo. Two of her favorite games that I will never forget her playing was Cool Spot and Donkey Kong Country, both on Super Nintendo. She also took us to a local store in a mall somewhat near her house that traded video games. 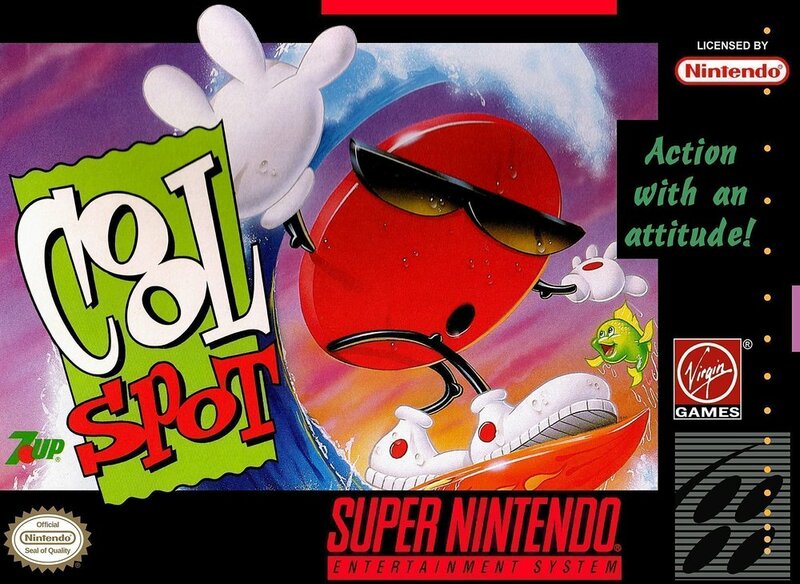 Now this is way before the days of GameStop and FuncoLand, something that I had never seen before in the very early 1990s. I still remember taking seven dollars and buying a copy of Bionic Commando for the original NES with the instruction manual rummaging in a bin in the middle of the store floor. 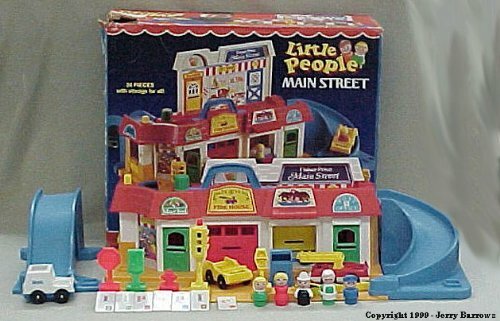 However, it turned out I didn't have enough money and had to borrow a dollar or so from Darcel to cover the sales tax. (I am from Tax-Free Delaware, what can you do, I was in 5th grade!) I will never forget when I was going through some pretty rough personal issues in college during the summer of 2002, Darcel and her parents Buster and Cindy took me to the Flight '93 memorial site back when it was just a rugged strip with a pile of dirt at the end where the plane finally came to a stop. She knew that I collected video games and afterwards took me to an old antique store where I picked up loose carts of Godzilla and Godzilla 2 for NES for under $15. Last August, I went to western Pennsylvania with my cousin Tom for a weekend to visit Darcel and her family. It was clear she was not doing well, but all the same it was like nothing had changed. There we were in her parent's living room playing Nintendo, or going out to dinner and joking around. It would be the last time either of us saw Darcel in person before her passing. I am so fortunate that our schedules aligned and we were to make that visit happen. She didn't seem in bad spirits and asked me to ship her some Philadelphia soft pretzels and "a new Game Boy". I sent her a Nintendo DS Lite and a bunch of her favorite games. She got to play those games for a couple weeks before she passed. I believe that there was a reason that God had us go out there when we did, and I am so glad that I was able to hear her say "I won't let this beat me" one last time. There is a method to my madness in this article, the point is you never know when one of your playmates won't be there anymore. We made a lot of memories together including her taking me to my first Drive-In movie double feature (Austin Powers: Goldmember and Men In Black II), going cruising on "the loop" with other fellow college students, and staying up all night playing video games. They say that some heroes don't wear capes, and Darcel is a person that fits perfectly into this category. 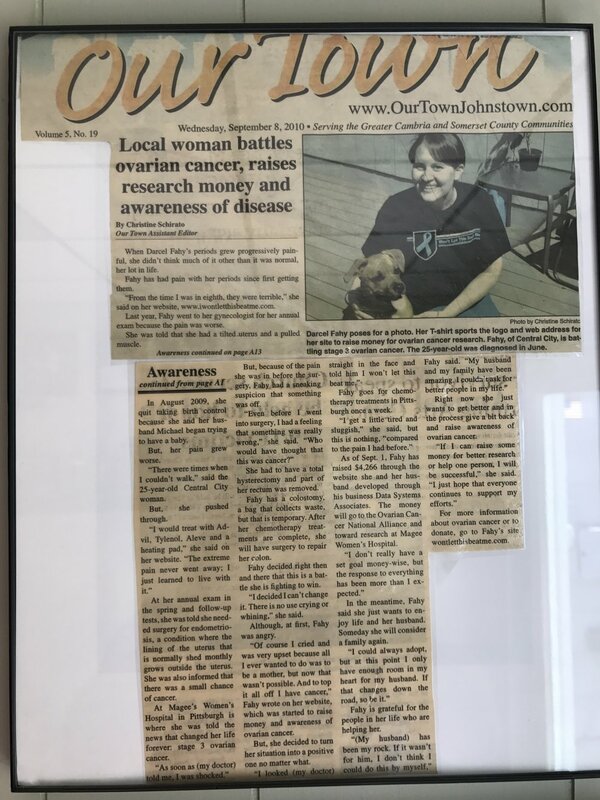 As she went through this grueling journey she continued to focus on others and advocating for ovarian cancer awareness. The strength she demonstrated will continue to serve as inspiration to me as she set a high benchmark. For more information about Ovarian Cancer, or to donate to Cancer treatment and advances please go here. Me, Darcel, and Tom - August 20th, 2017. Exactly two months before her passing.